There’s no need to boil water to home-brew iced tea. Photo by Kelly Cline | IST. If you brew pots and pots of iced tea to get through the summer heat, here’s a way to do it that requires no hot water. Instead of brewing tea the conventional way, in boiled or near-boiled water, do it via cold infusion. The tea steeps in cold water—really! The process might sound strange, but it works and can produce even more highly-flavored tea. Instead of the conventional steep in very hot water for three to five minutes, cold infusion steeps the tea in cold water over eight hours or overnight. The process draws out the natural sweetness in the tea leaf. And since it’s such a gentle process, it’s hard to over-brew and draw out the bitter tanins as steeping in boiling water can. To make a batch, add a generous two teaspoons of tea (or two tea bags) to 8 cups of cold water. Refrigerate for four or five hours. Strain as needed and serve. Results are more noticeable depending on the type of tea used. Cold infusion shows Darjeeling tea to better advantage, for example. You can add another layer of flavor by infusing herbs or fruits with the tea. Mint is the herb standard-bearer for tea; but if you have other sweet fresh herbs at hand (such as basil, lemon basil or rosemary), use them. Crush the herbs in your hand first, to release the aromatic oils. Or, slice in some stone fruits—cherries, nectarines, peaches, plums or nectarines. Sun tea is a similar process: tea made with cold water instead of hot water. The difference is that it is placed in a sunny location to steep, and the warmth of the sun speeds up the steeping process. To make sun tea, follow the same instructions as for cold infusion, but let the tea steep in the sun for four hours—on a window ledge, the porch or other sunny spot. Then refrigerate. As with cold infusion tea, experts note that the gently slow-brewed, tea has stronger flavor than conventionally hot brewed tea. 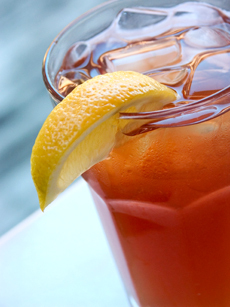 Find more iced tea recipes in our Gourmet Tea Section.